TechnologyIQ: Video: Be An Internet Skeptic! Video: Be An Internet Skeptic! 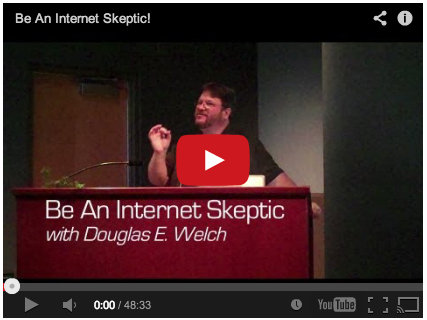 Douglas presents "Be An Internet Skeptic!" to the Docents of the LA Zoo on Friday, September 14, 2012. This video contains both video and slides. Sorting valid information from Internet hoaxes can be a daunting task, but a few simple steps can help to disqualify and debunk most hoaxes very easily. Learn a couple of simple tools for online debunking and learn why people sometimes "lie" on the Internet. Once you know how people benefit from suspect information, it becomes easier to spot hoaxes from the start. Can't se the video above? Watch "Be An Internet Skeptic!" on YouTube.